Experiencing an environment triggers a two-way exchange between the environment and its observer, a process that bridges materiality and immateriality by creating what Kevin Lynch calls an “environmental image.”1 Such an image consists in a “generalized mental picture of the exterior physical world that is held by an individual”2 and it is critical in contributing to the subject’s ability to engage his/her environment, from orientation and way-finding to social interaction and emotional mooring. Environmental images are drawn both on personal—subjective—factors and on collective—objective—responses to sensory cues. “The Image of the City,” Lynch’s famous volume, sets out to investigate the latter: how the physical environment can be planned so that its corresponding image is “vividly identified, powerfully structured” and “highly useful.”3 These features account for what Lynch calls “imageability”: the “quality in a physical object which gives it a high probability of evoking a strong image in any given observer.”4 In the near future, the technology-driven rebalancing of objectivity and subjectivity in the perception of urban environments might call into question the relevance of such prescriptive approaches. This essay attempts to re-frame imageability in the context of the Augmented City and to envision and propose a new, digitally externalized, environmental image. The Augmented City is a mixed urban environment where virtual and material objects entwine and are simultaneously experienced, one where cyberspace and the physical world co-contribute to the construction of reality. In this near-future cityscape, it seems unlikely that urban orientation and way-finding will rely on physical cues. Here is why: (1) Today’s widespread usage of GPS navigation systems and applications in cars and smart phones heralds the substitution of do-it-yourself way-finding in favor of reliable technology-led navigation apparatuses. (2) Digital navigation provides increased security and minimizes the probability—both actual and perceived—of becoming lost. (3) Computers tend to be more reliable than people; they have slimmer margins of error and can pick-up and adapt real-time information such as weather forecasts, news reports or service changes. (4) Satellites see farther than eyes, their vision being unbounded by environmental barriers and unobscured by darkness. Even in the absence of sensory cues, they know where the next subway station is and how to lead me to it. The transposition of navigational cues from matter to bits does not necessarily promote digital alienation. On the contrary, a subject’s physical surroundings are emphasized and continued by digital information overlays: their gaps filled, their inefficiencies smoothed away, their visibility augmented. 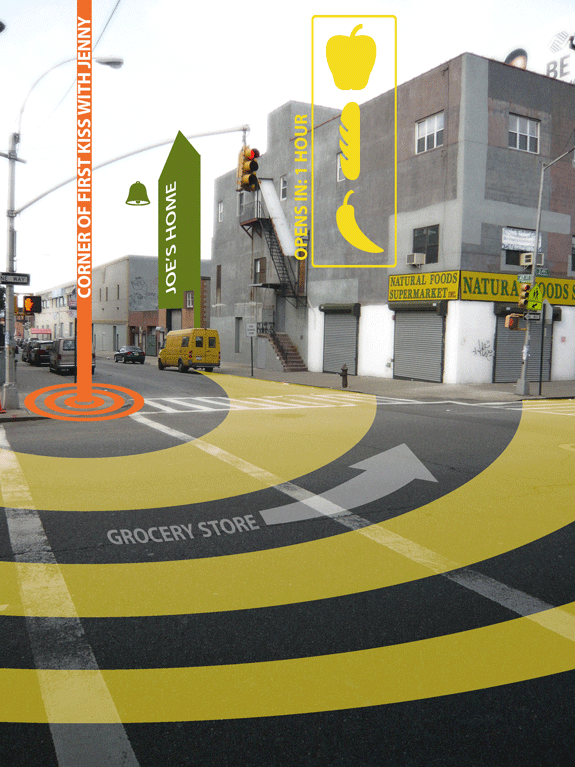 The mediated inhabitant of the Augmented City must still read and interpret his/her environment in order to successfully engage it, but the necessary identity and structure—characteristic of Lynch’s paths, edges, districts, nodes and landmarks—are not embedded in the mediated object, but designed and programmed into the mediating interface. Going one step further, we might wonder if matter-embedded objectivity is doomed. Today objects of all scales from forks to buildings to entire neighborhoods owe part of their shape and inner organization to the demand for discernable images. A door, for instance, is defined by the capacity to perform a function—open and close— but its hinges and handles are not only functional pieces of hardware, but also cues helpful to recognize the object ‘door’. In a building, the entry door is still defined by its function—providing access and connecting inside and outside— but in the context of the city the door’s success depends almost exclusively on its ability to signal presence and to be found. To this end, architects have historically employed clusters of strategic indicators: canopies, entrance plazas, variations in scale, symmetry, ornamentation and so forth. Now, in a mixed setting where indicators are predominantly digitized, how will the practice of architecture change? How will buildings organize the relation of their parts to the whole if the semantic link between user and physical building is broken? The way we understand and design the environment may be on the brink of a paradigm shift. Of course, there is an inherent risk in replacing physical orientation and way-finding cues with electronic systems, the most obvious ones being the possibility of mechanical failure, black-outs and technological segregation, but these challenges aren’t much different from those met thousands of times by human beings employing new technologies: from the reliance on fire in food preparation or lighting to extend the day, to the use of cars and airplanes to move around and the adoption of computers to process and store data. The urbanites Lynch had in mind when writing “The Image of the City” were different from us and from the future dwellers of the Augmented City in significant ways. Their experience of the urban environment is implicitly counterposed to the domestic experience, one characterized by maximum perceived security and privacy, impeccable orientation and absolute control over the identity and organization of space. At home we feel safe, we are able to orient ourselves in pitch dark, and we are aware of the content of each drawer, shelf and wardrobe. In this sense, home could be re-defined as the bounded space of perfect correspondence between a subject’s environmental image and the environment. A correspondence, it is worth noting, that derives more from familiarity and habit than from an objective, coherent organization of space. Now, when Lynch’s subjects venture out of the domestic sphere, they leave behind not only the constellations of objects and functionalities with which they appropriated their home, but the very capacity to appropriate space with similar pervasiveness. On the contrary, the contemporary electronomad can carry along with himself/herself, in the form of bits and networks accessed through portable and wearable devices, many of the functionalities and belongings once associated with domestic life.6 Furthermore, if, as inferred, real time information overlays will absorb and broadcast part of the identity and structure of the built environment, the mediated/mediating citizens of the Augmented City will be endowed not merely with control over environmental images, but with control over the environment itself. Extreme customization is the ability of the technologically equipped subjects of the near future to customize their own perception of the urban environment through digital curatorial channels, locational feeds and mnemonic geographies. It is an electronic filter capable of mediating the cityscape according to one’s interests, memories, social values, group associations, tastes and so forth.7 In conclusion, we can predict that subjectivity will play such an extensive role in the experience of mixed space, that its virtual layers and the subject’s corresponding mental images will often overlap and merge. The environmental image of the future will be an externalized digital representation of customized objective and subjective cues; an electronic spatialization of identity, structure and meaning; a ubiquitous dimension of home. 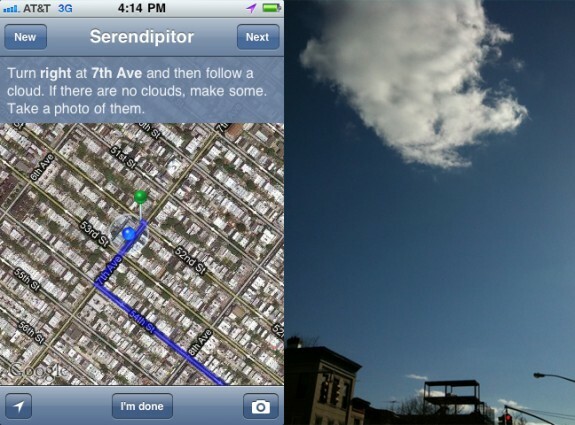 The bright and milder weather in New York City today enticed me to finally try out Mark Shepard’s celebrated Serendipitor, a navigation app for iPhone that helps you, as the slogan proclaims, “find something by looking for something else.” The application combines directions generated by Google Maps API to instructions for action and movement inspired by artists such as Vito Acconci, Yoko Ono and the Fluxus collective. It hacks the embedded “Maps” application and shifts its emphasis from fast and efficient “getting from A to B,” to the experience of the journey itself, one populated by serendipitous “action” events. Upon mapping a route based on a random destination, I set out for my indeterminate journey. Serendipitor provided a series of instructions, some easy (get on a bus and ride for one stop, walk toward green traffic lights until you reach a red one, pick a person to follow for two blocks), some inspiring or poetic (follow a cloud, head toward the sound of traffic and take a photo of the sound, buy a flower and give it to someone) and some creepy or outside of my comfort zone (hitch a ride with a passing car and find out where it takes you, ask someone to take you to the part of town they are afraid of). I didn’t follow all instructions—it is hardly the point—but enjoyed the experience immensely. Most interesting was the realization of having stepped into a different—almost virtual— realm of navigation: free from everyday causality, productivity and social norms. Metaphorically speaking, I was inhabiting a different channel of reality, a different feed. I was engaging the city from without my comfortable habits, specific interests and ideas. As a matter of fact, there was an uncanny component to the experience. More than inhabiting my own feed, it felt as if occupying someone else’s. At times, I had the impression of playing a video-game, of carrying out orders transmitted by some higher power pushing buttons on a joystick while stroking a cat; The streets and homes around me had become devoid of the contextual meaning that makes them real, and could disappear at any moment. These thoughts, along with the idea that in the future live instructions based on real-time encounters or on data picked up by the phone’s camera might be somewhat more accurate and engaging, reminded me of the movie Gamer. In the movie, evil genius Ken Castle invents a technology to link two human bodies so that one can remotely control the other like a real-world avatar. The technology is employed in two hit multi-player on-line games: “Slayers” and “Society.” The first one forces death row convicts to fight among themselves while being remotely controlled by teenage players, the second allows a sort of (un)mediated prostitution where the sexual service is performed not on the client him-/herself, but on the doppelgänger’s body. Without suggesting parallels between the movie’s dystopian games and Serendipitor, it is interesting to note a similar element of remote control, and wonder how future smart phone applications may serve not only as direct lenses to focus, distort and customize reality, but also as tools for controlling and being controlled, for psychotherapy, for trying out identities and role play. Another interesting dimension of Serendipitor is that of interaction—interaction with strangers. However, if the user of Serendipitor engages unaware non-users— and the situation is therefore unilaterally defined and potentially awkward—a new app puts forward a different premise: that of complicity. 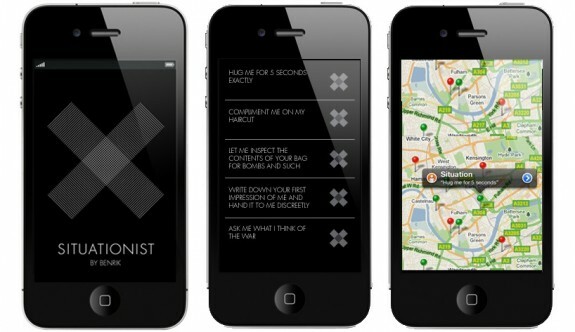 Benrik’s Situationist is an iPhone app inspired by the Situationist International’s call for experimental forms of behavior and geared towards generating impromptu encounters. Users make up a profile by uploading their picture and selecting—or suggesting—situations they want to happen to them, from the friendly “Compliment my haircut” or “Hug me for 5 seconds exactly” to the more subversive “Help me rouse everyone around us into revolutionary fervor and storm the nearest TV station.” They are then notified of each other’s proximity in order to act out situations, which—beware— could occur anywhere and at any time. “Merely by having it on your phone—the creators maintain—your urban environment is transfigured: everyone you see is a potential encounter.” It is exciting to witness the rise of (free) tools for serendipity and experimental navigation and interaction, and to realize what a broad impact these tools can have in our perception of others and of the built environment. They remind us of the interconnectedness of all beings across socio-economic barriers and afford us a glimpse into a dimension of ourselves unbound by the routine of everyday survival. Today I had an article published on Lo Squaderno – Explorations in Space and Society. The article, entitled “Cyber-Imageability,” aims at re-framing key concepts from Kevin Lynch’s landmark book The Image of the City in light of contemporary and future modalities of urban navigation. My contention is that way-finding in the Augmented City—an environment made up of as many bits as atoms—will rely more on technological mediation and subjectivity than on objective physical cues, with the following outcomes: 1) In a city (Keiichi Matsuda appropriately calls it domesti-city) appropriated with ever-expanding electronomadic tools, environmental images—our mental pictures of the physical world—will increasingly become externalized and digitized. 2) If “legibility” ceases to be a condition for successfully inhabited physical space and efficient relating of building parts, architecture may endorse the radical possibilities afforded by illegibility. More on this soon. 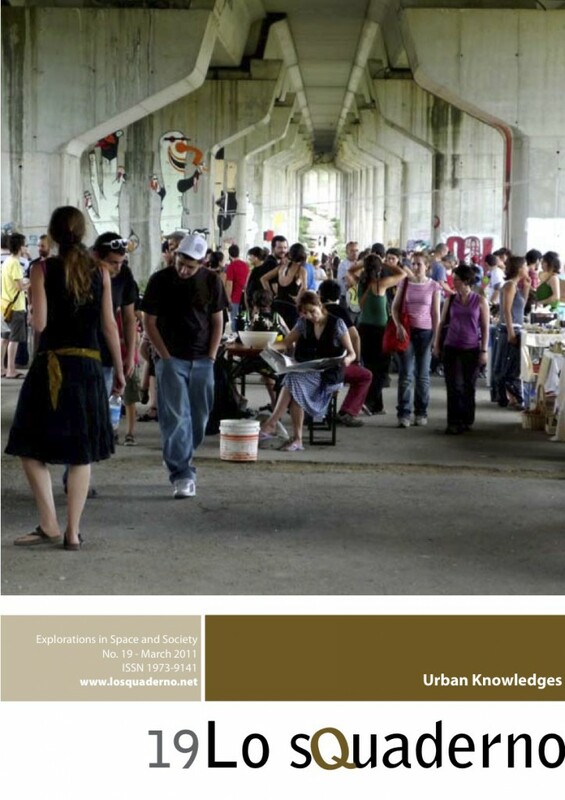 For now, enjoy Lo Squaderno No.19 “Urban Knowledges.” You can download it in its entirety here.